Researchers at Purdue University and Stanford University believe they have found a novel laser light sensing technology that is more robust and less expensive than currently available with a wide range of uses, including a way to guide fully autonomous vehicles. The researchers say their innovation is orders of magnitude faster than conventional leading-edge laser beam steering devices that use phased antenna-array technology. The laser beam steering being tested and used by Purdue and Stanford is based on light-matter interaction between a silicon-based metasurface and short light pulses produced for example by a mode-locked laser with a frequency-comb spectrum. Such a beam-steering device can scan a large angle of view in nanoseconds or picoseconds compared with the microseconds current technology takes. “This technology is far less complex and uses less power than existing technologies,” said Amr Shaltout, a post-doctoral research fellow in Materials Science and Engineering at Stanford who conceived the idea for the method. Laser beam steering is a vital technology that can be used in a wide variety of areas including navigation, space flights, radar applications, imaging, tag-scanners, robotics, archaeology, mapping and atmospheric physics. Faster laser scanning is directly related to higher frame rates as well as improved imaging resolution. Shaltout came up with the concept while earning his Ph.D. from the Vladimir Shalaev research group at Purdue’s School of Electrical and Computer Engineering and delineated it at Stanford when working with the research group of Mark Brongersma. The researchers say their innovation is chip-compatible technology that doesn’t require additional sources of energy. It is based on light-matter interaction between metasurfaces and short pulses from mode-locked lasers with equally spaced phased-lock frequency lines. Another key element is using a metasurface based on patterned silicon film. “That’s the basis for all of the electronic circuitry at the nanoscale to give this exciting functionality that allows the beam steering to happen,” said Brongersma, a professor in Stanford’s Department of Materials Science and Engineering. Autonomous cars depend on light detection and ranging, or lidar, which is similar to radar only instead emits infrared or visible light that measures how long it takes for the pulses to reflect back off objects and take their images. It would replace the spinning device frequently seen atop roofs of autonomous cars. But that existing technology remains expensive as businesses look for ways to transform the burgeoning autonomous car industry. Shaltout said the use of photonic metasurfaces was key to the new advancement. 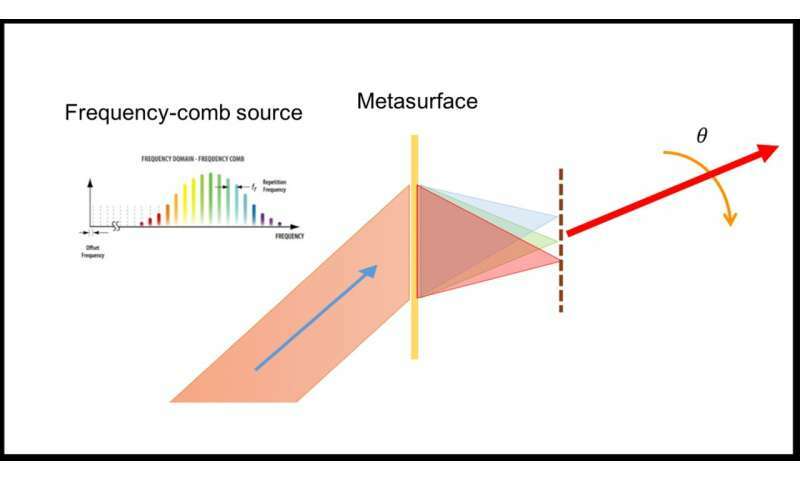 He said metasurfaces provide simple, compact and power efficient solutions to photonics design. The combination of those two technologies provide a much simpler approach. In current phased-array optical technology, each antenna needs to be controlled in what it radiates individually. Under Shaltout’s system, each of the structures emit slightly different frequencies, meaning there is no need to address each individual antenna continuously and consuming power during that process. Shaltout said an interdisciplinary solution was the key factor. “Sometimes working outside our field help us to see, to find solutions to problems in different fields and just link them together,” he said. The challenge for the researchers now is to scale up the innovation and move it from the laboratory to the real world. They are looking for investors, partners or possibly licensing agreements as they work to move forward scaling up the technology. The first developments might be in areas such as scanning devices at stores, airports or in many other areas before moving on to autonomous carsand automobile original equipment manufacturers. “This seems to be a disruptive solution which could make a big difference in this huge, emerging industry,” Shalaev said.